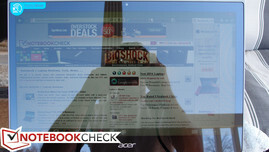 At the moment, there is a sizable hole in the market for affordable touchscreen Ultrabooks. 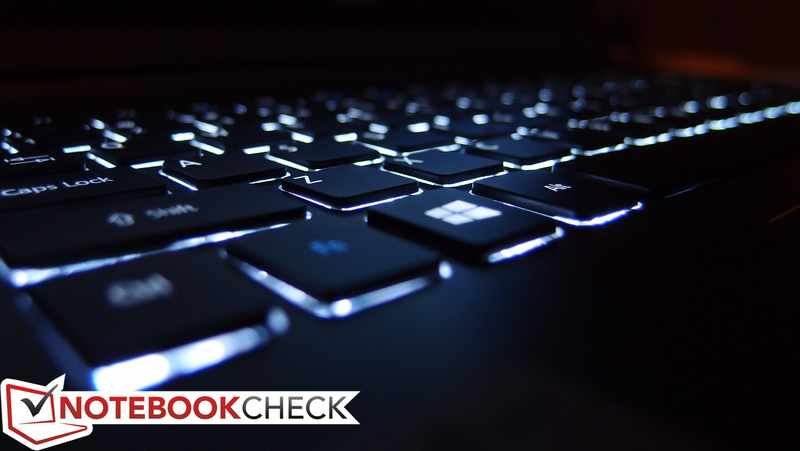 Though Windows 8 could hardly be hailed as a runaway hit, the increasing share of consumers warming up to the concept of touch interface on a notebook has begun to alter the landscape of the market. The problem is simple: if you want an ultraportable, fast, touchscreen notebook, but you don’t want to spend a lot, your options are quite slim. But they’re getting better. 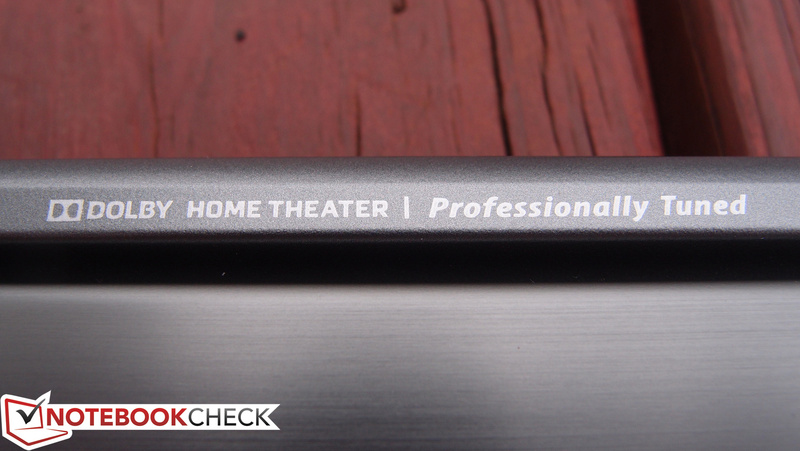 Much like its predecessors, the M5 straddles the line between high-end Ultrabook and budget notebook. But it accomplishes this in ways that—at least in some areas—cleverly disguise the compromises prescribed by the constraints of its pricing. The real question, however, is whether the initial charm extends beyond mere first impressions. 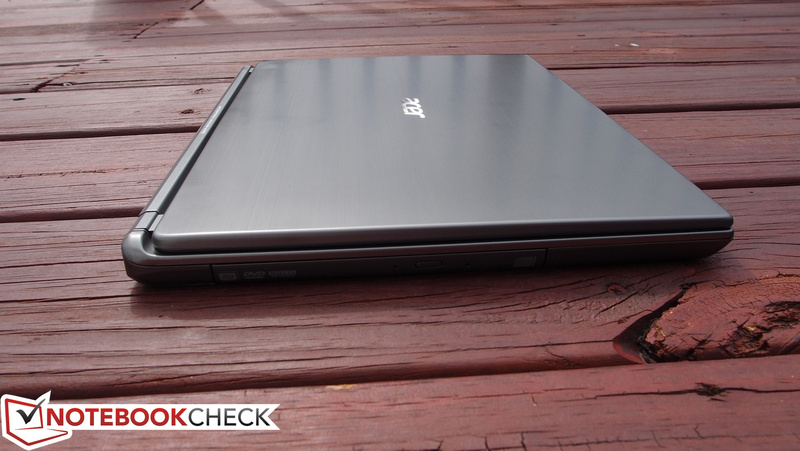 Our Acer M5-481PT review unit sports an Intel Core i5-3337U dual-core CPU with Intel HD Graphics 4000. 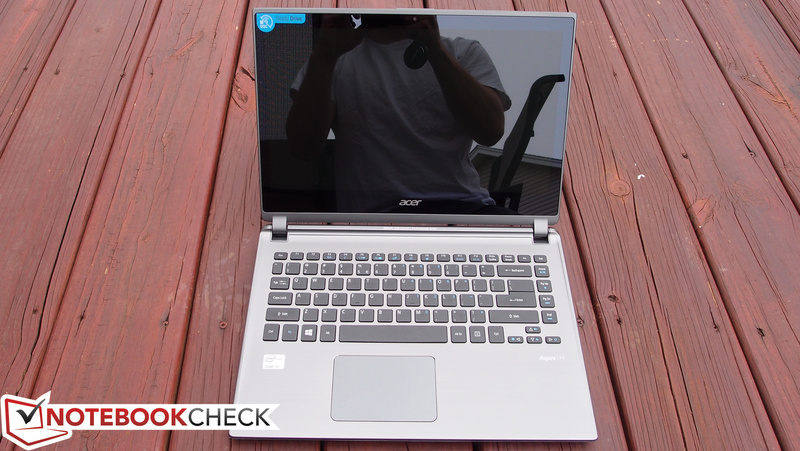 This configuration can be found on Acer’s website for just $729, as well as at Best Buy for around $700. Now that we’ve become acquainted with it, make yourself comfortable as we explore every aspect of the notebook in glorious detail. 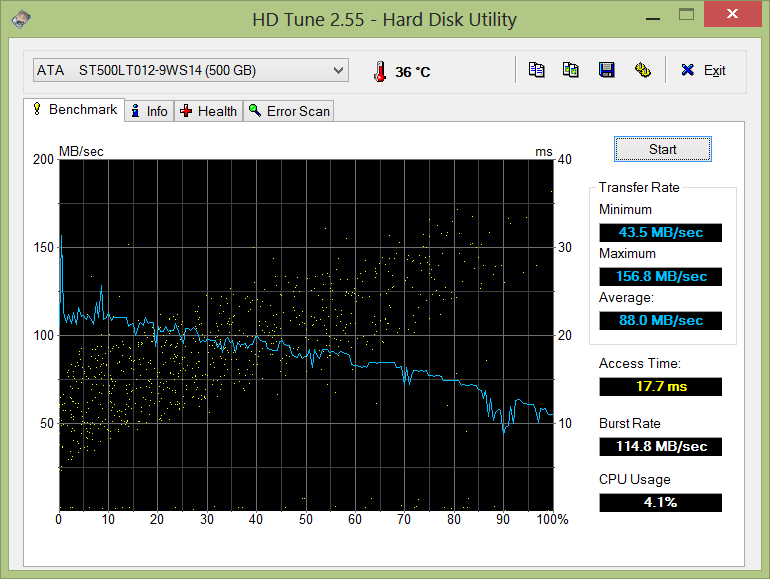 As mentioned earlier, the M5 zig-zags between the categorical divisions of luxury Ultrabook and budget notebook. The first and most obvious example of this is its case design. For instance, while it’s mostly comprised of plastic, there is enough metal and soft-touch surface in the mix that it at least appears and feels higher-end than most basic models. 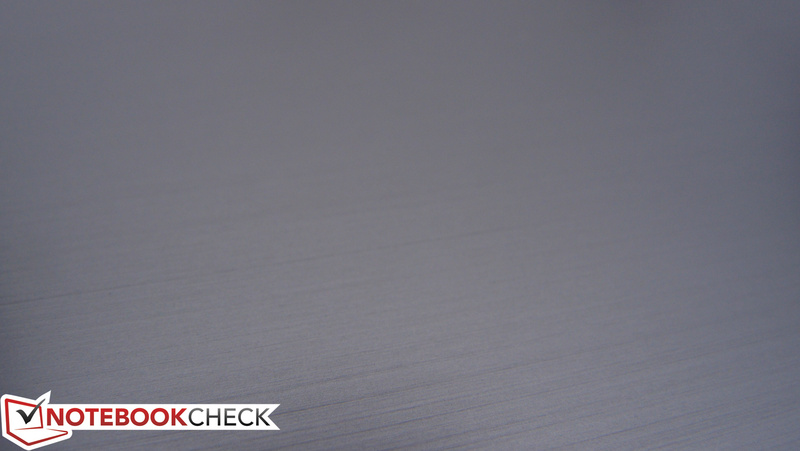 It’s a far cry from the gorgeous aluminum of an ASUS Zenbook or Dell XPS 12, but it’s halfway there nonetheless. The areas that count the most—namely, the display lid and the top of the base unit—are both outfitted with a sleek brushed aluminum/magnesium alloy that has a muted gray coloring, which gives the M5 a fairly high-end appearance. You’d be forgiven, then, if you didn’t immediately notice that the bottom of the base unit (including the majority of the sides) is actually plastic, as the coloring blends relatively seamlessly with its metal counterparts. To its credit, it has a sturdy enough feel to it, and the matte finish provides a much nicer look than the chintzy gloss of most budget models. The same goes for the bezel and hinge covers, which—again—are of matching color, but are actually plastic sporting a soft-touch rubbery finish. Even in spite of said plastic, the entire unit feels mostly rigid. 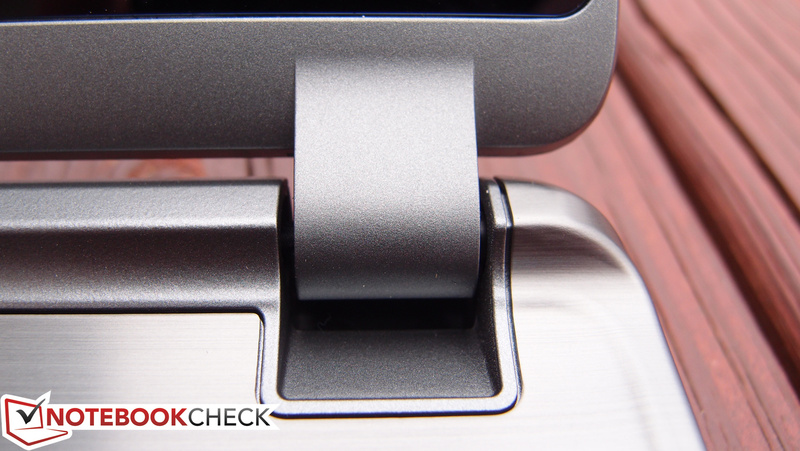 There is a slight bit of flex along the center line of the base unit, but it shouldn’t be a problem during normal use. Likewise, the metal-backed display lid seems sturdy enough, though some degree of distortion is producible given pressure on the back of the lid. Neither of these problems is likely to manifest itself during typical usage, however—so for the most part, it’s safe to say that this is a fairly solidly-built notebook. 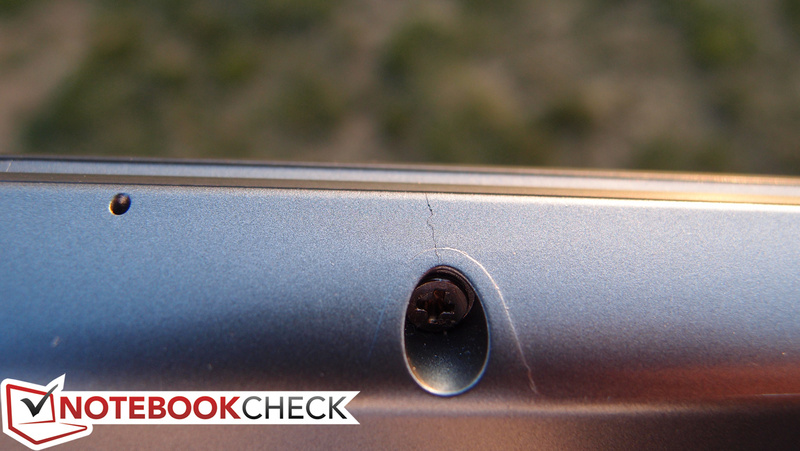 One notable exception, however, is the small space between the front of the unit’s base and the recessed screw compartments on the front bottom of the notebook. On our review unit, a close inspection actually revealed a hairline fracture in the plastic at this point (see our photo), indicating an obvious point of weakness amongst an otherwise somewhat durable package. 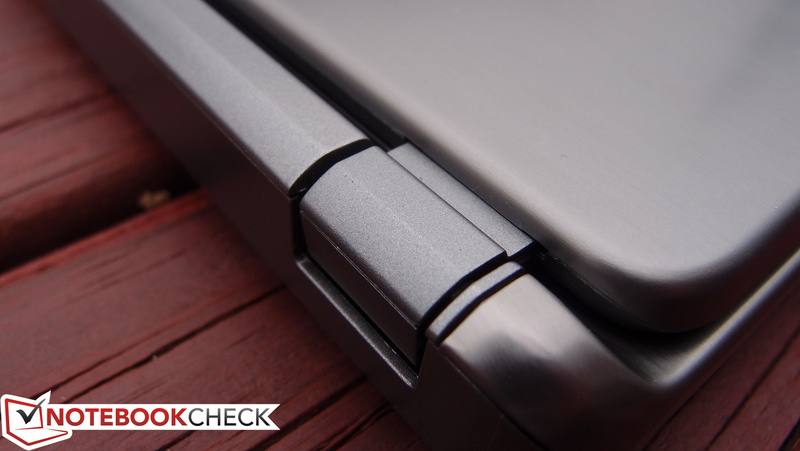 Elsewhere, the hinge covers are entirely plastic, but the hinges themselves do a fine job of supporting the screen. Very little wobble applies under normal conditions, and yet the notebook can still be opened using one hand reasonably easily. Overall, fit and finish is superior, with parts fitting tightly together and no manufacturing inconsistencies apparent. With a few exceptions, this appears to be a nicely built notebook for its class. A quick note regarding maintenance on the M5-481PT: it’s not for the faint of heart. In order to access nearly every component, the optical drive, entire top cover, and keyboard must all be removed, along with an array of cables and—depending on what you wish to replace—possibly other items too, such as the internal audio board. This process involves no fewer than 20 screws. Given the adequate thickness of the M5-481PT’s case, one would hope for a generous array of ports. Instead, we’re left with just a small handful, including two USB 3.0 ports (one powered), HDMI, and Gigabit Ethernet, along with a welcomed SD card reader on the right side. 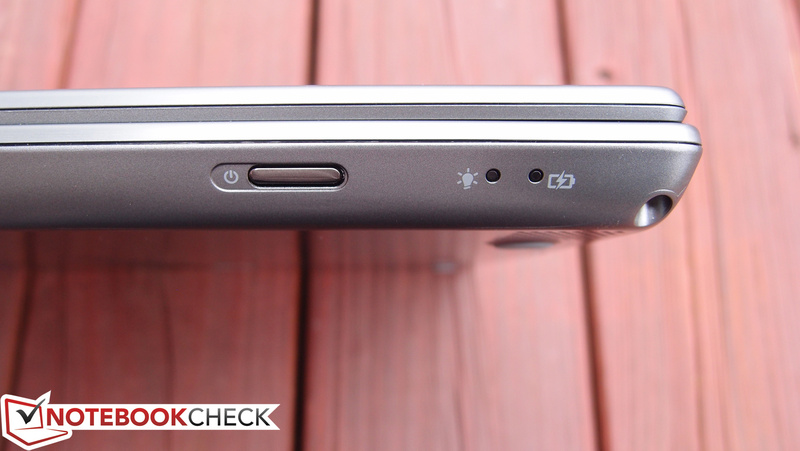 Moreover, the four main ports have all been relegated to the back side of the base unit, meaning you’ll have to rotate the laptop (or reach all the way around the side) in order to access any of them. They’re also situated uncomfortably close to one another, making larger USB devices difficult or impossible to use in conjunction with one another. 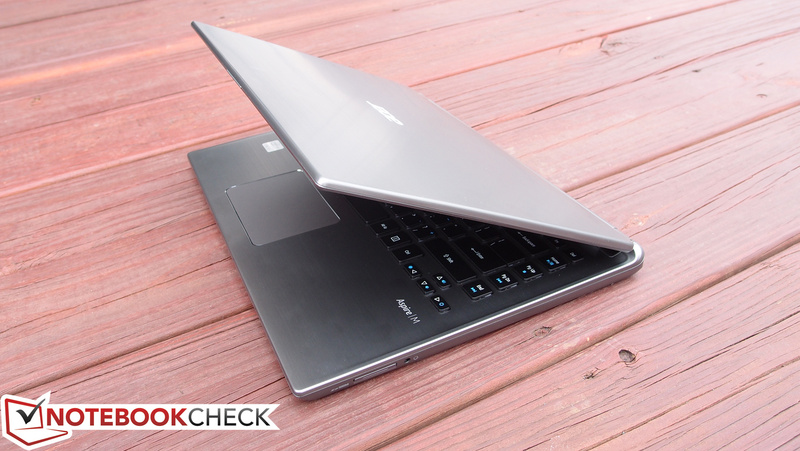 On the bright side, this Ultrabook does manage to include an optical drive, something which is often missing from comparable models—and it supports the new M Disc technology (more on this in the Accessories section). 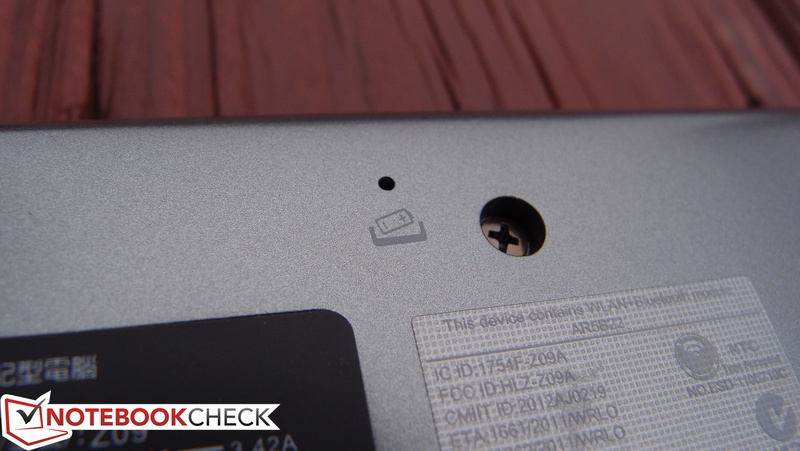 One final oddity is the location of the power button on the bottom of the front of the base unit, which is not only difficult to locate but also which is somewhat prone to accidental presses. Our test unit was packing a Qualcomm Atheros AR5BWB222 Wi-Fi adapter, which supports the typical 802.11a/b/g/n. You’ll find a Broadcom Gigabit Ethernet adapter on board as well. Rounding out the wireless connectivity repertoire is Bluetooth 4.0. 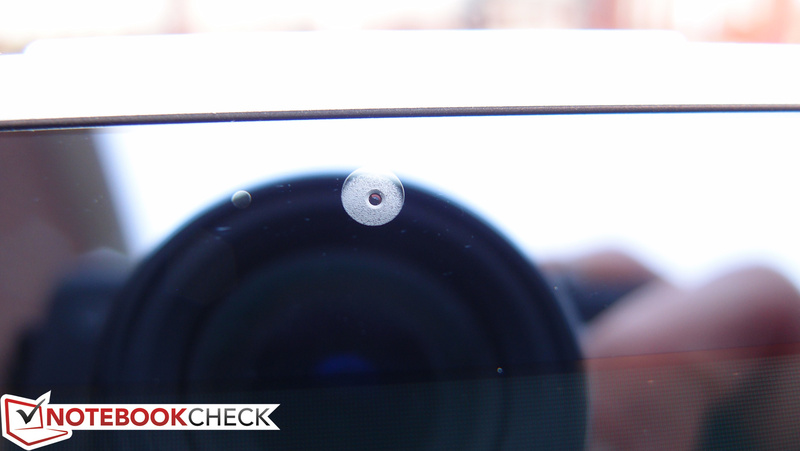 Finally, above the screen is a 1.3 megapixel webcam to accommodate all of your Skype-oriented needs. 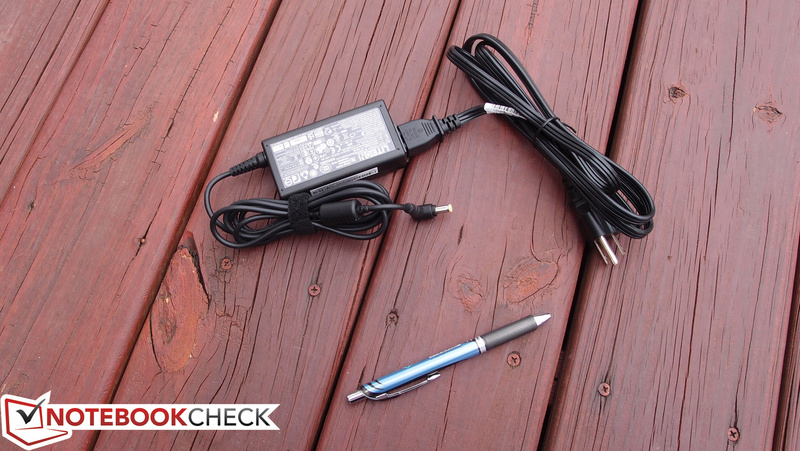 The only accessories bundled in the box with our Acer M5-481PT were an average-sized 65W AC adapter and a microfiber cloth to clean the touch screen. 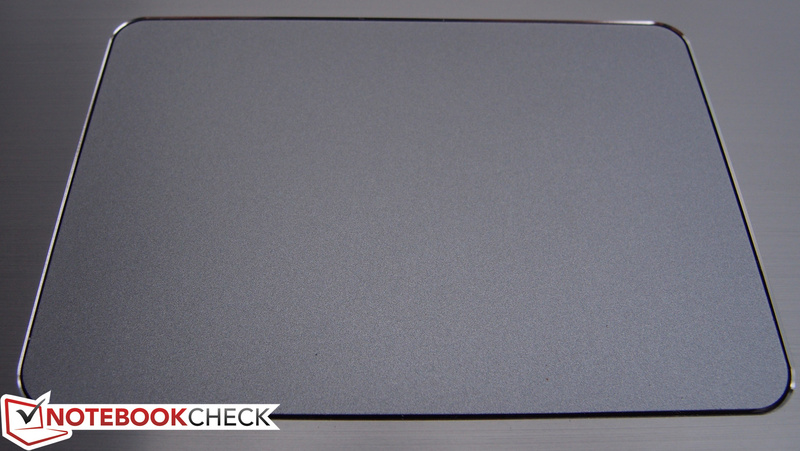 A single DVD-M Disc is also included, which is a special technology that allows for supposedly worry-free data archiving when used with compatible burners (one of which is included in the Acer M5). The discs are extremely durable and write at just 4X speed, but are advertised to last for “millennia”—hence the nomenclature. 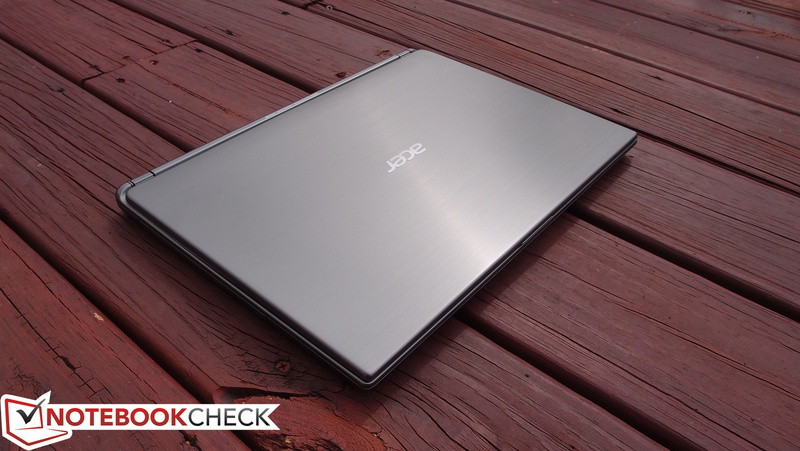 The Acer M5 comes with a 1-year parts and labor warranty (mail-in or bring-in). There is also 90 days of software support. No other warranty options exist. 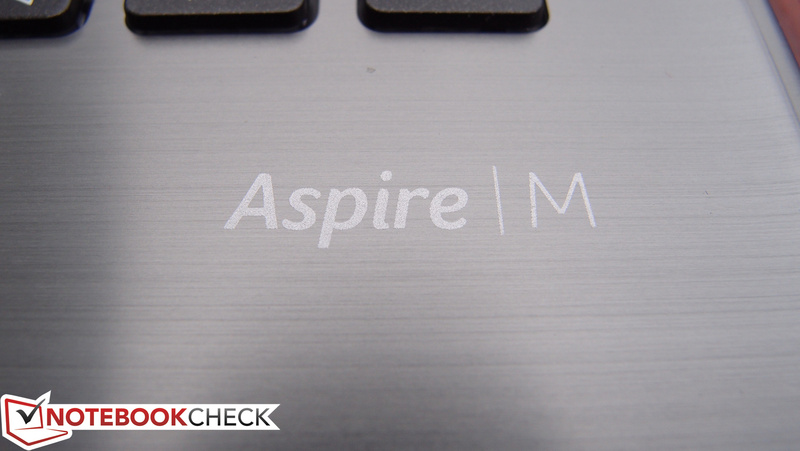 The full terms of the warranty can be found straight from Acer at this link under Notebooks – Consumer (Aspire). The touchpad is roomy, but positively awful. 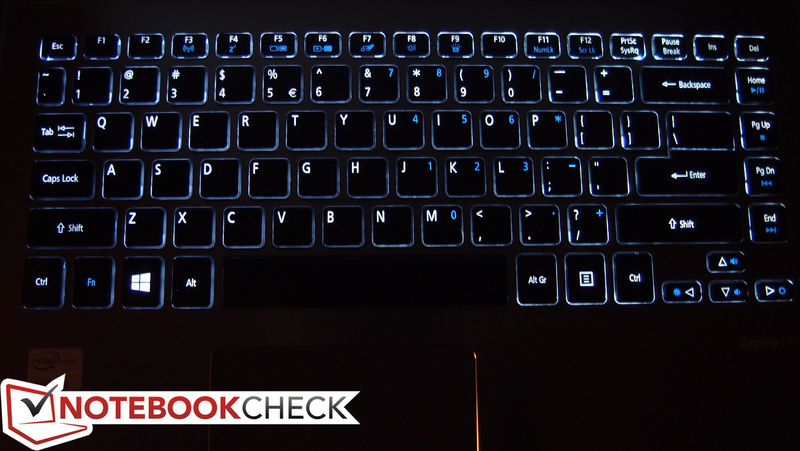 The Acer Aspire M5-481PT’s chiclet-style keyboard isn’t anything remarkable, but it isn’t offensive, either. The plastic keys exhibit very little rattle and are spaced well, featuring flat, smooth surfaces. Typing is quite comfortable, with minimal effort required to depress the keys, and the quick (though slightly mushy) stop relays sufficient feedback. The only real catch is the short key travel, but after a while it’s likely that the user will become used to this. 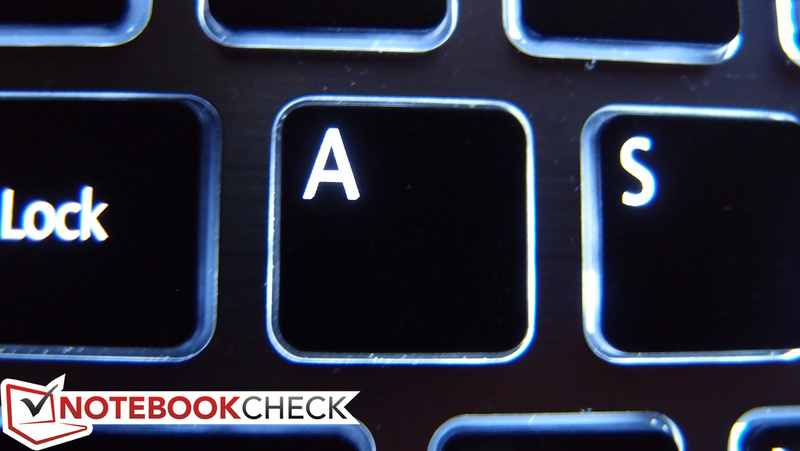 After a few hours of use, we had little trouble typing quickly and effortlessly. 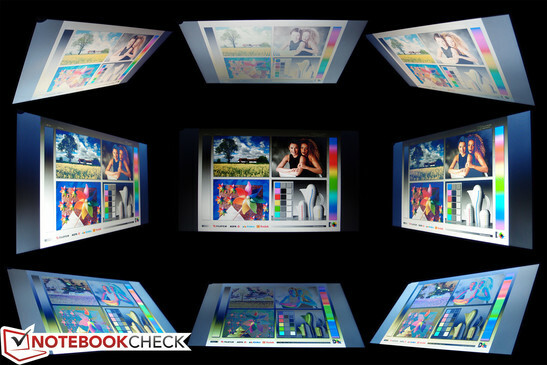 The M5’s 10-point multi-touch display is accurate and easy to operate. Thanks in part to the frustrating nature of the touchpad, we defaulted to using the touchscreen whenever possible for navigation within Windows 8—and, as we’ve said before, Windows 8 is made for touch. Scrolling, zooming, rotation, and other multi-touch gestures are all nearly-flawlessly interpreted. 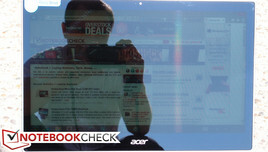 Speaking of which, the included Acer Ring software is actually quite useful (hit the link for more details). The first big negative looming over the M5-481PT’s head is its screen. The 14-inch HD (1366 x 768) LED-backlit glossy screen hardly impresses in terms of resolution, but that’s only the beginning. Its pixel density of just 112 DPI can’t hold a candle to that of many competing Ultrabooks, which boast values of as much as 189 DPI. 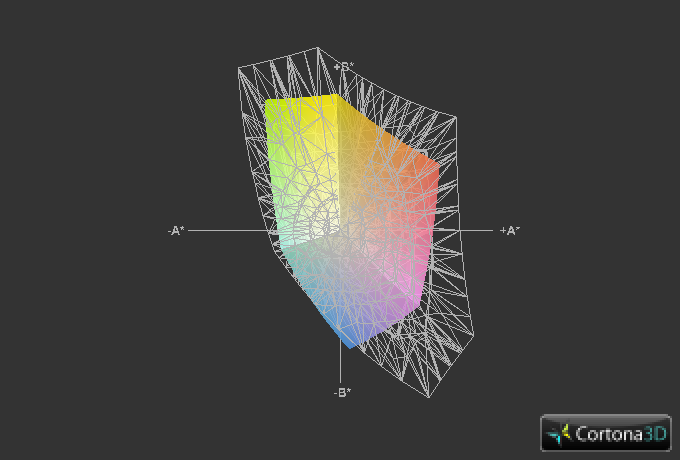 Colors also appear relatively flat and contrast is unimpressive. Luminosity is also severely disappointing. 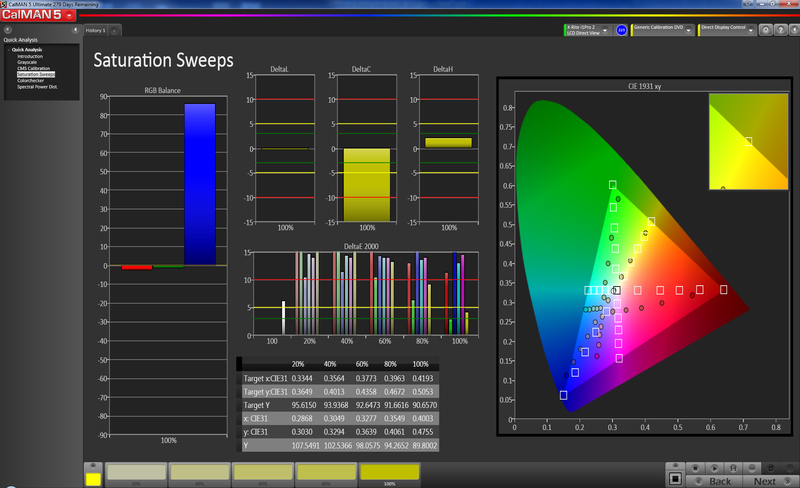 Managing an average brightness of just 166 nits, it’s weaker than even most budget TN panels on the market. This becomes particularly offensive when you factor in the edge-to-edge glass covering the panel, making its reflectivity even more noticeable. Distractive reflections are a fact of life with the Acer M5, even in many indoor scenarios in front of a bright light or window. Adding insult to injury is a low contrast ratio of just 166:1, a result of the rather high black value of 0.98. 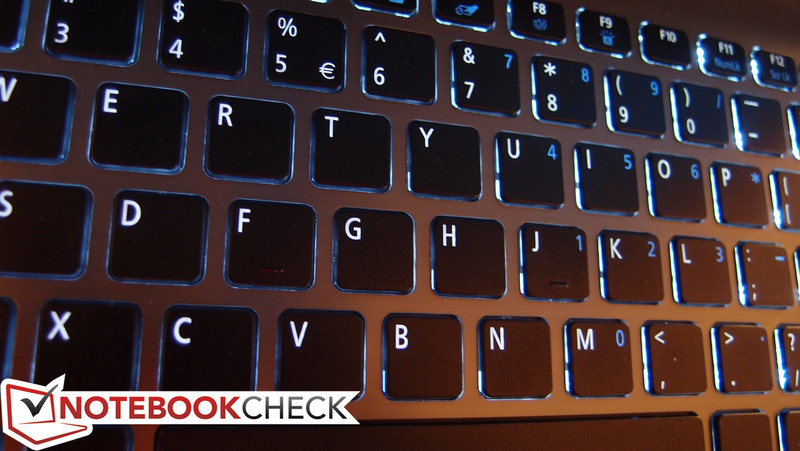 In dimly-lit scenarios such as office environments, most of these deficiencies will not prove too disturbing, but just about anywhere else, you’ll constantly be fighting to position your screen in search of a comfortable view. Our measurements of the display’s color reproduction reveal a poor 52% coverage of the sRGB spectrum (which explains the subjective “flat” appearance of the colors as we mentioned earlier). This may not bother the average user, but anyone looking for any degree of color accuracy (for photo editing or otherwise) will certainly want to look elsewhere. Further analysis of the display using CalMan 5 and an X-rite i1 Pro Basic 2 revealed significant deviations; nearly all colors are poorly represented, with white, red, blue, cyan, and magenta all flaunting DeltaE values north of 10 (blue in particular is almost 19). 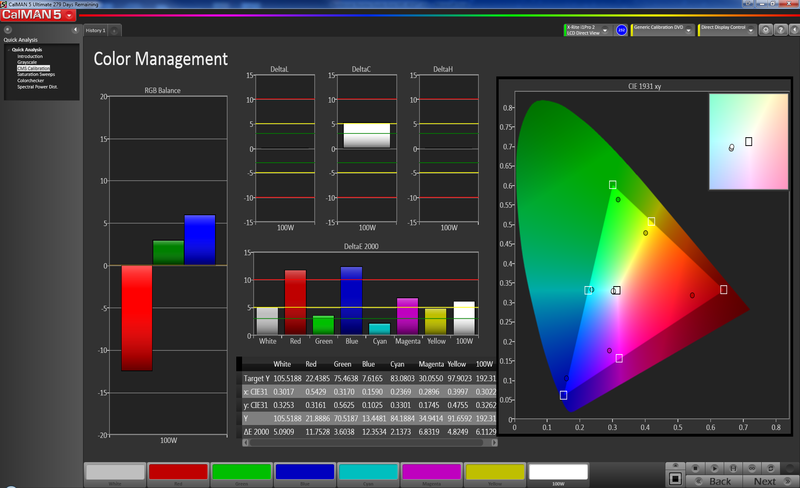 The other colors are less problematic with values closer to 5. 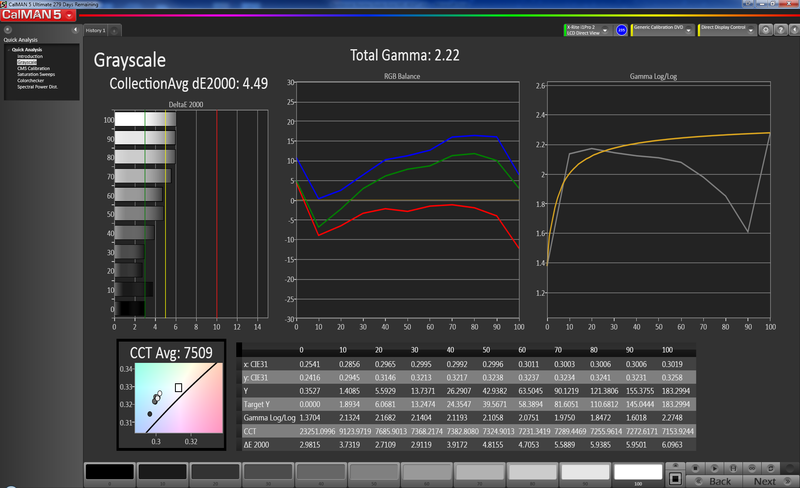 Post-calibration, matters were (naturally) improved, though red and blue remained a problem. As you might have guessed, the M5-481PT is hard to use outdoors. This is thanks to its low brightness, poor contrast ratio, and glossy edge-to-edge glass, which results in constant obstructive reflections. 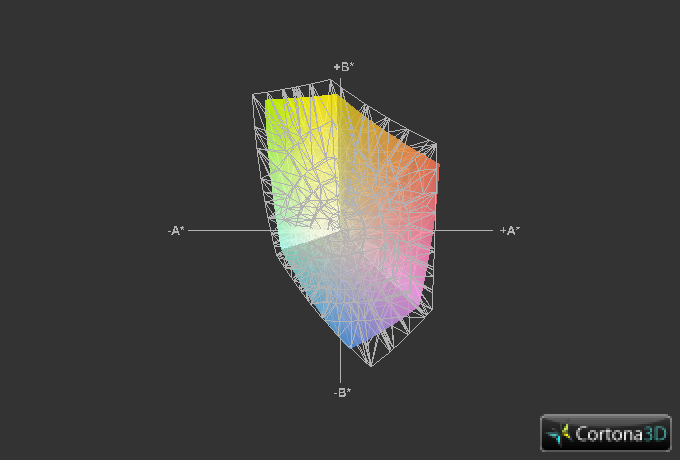 The display is readable in shaded areas when viewed from strategic angles, but it’s never comfortable. Finally, the viewing angles are unsurprisingly average. 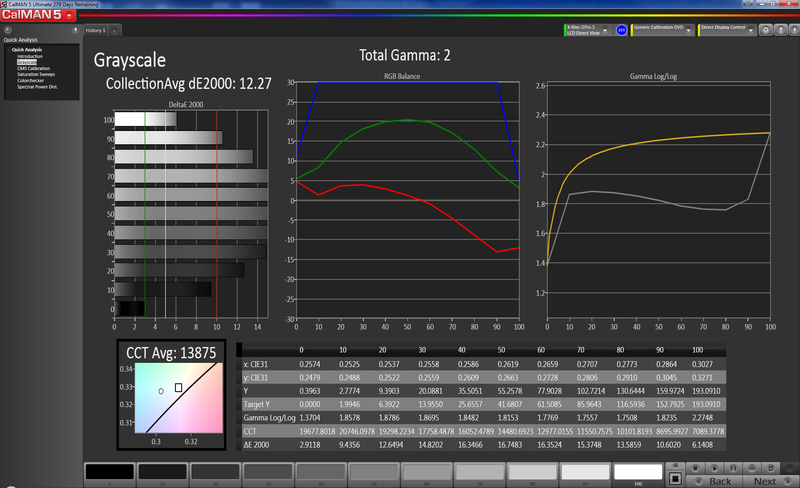 Vertical deviations result in the usual color inversion and severely washed-out brightness. 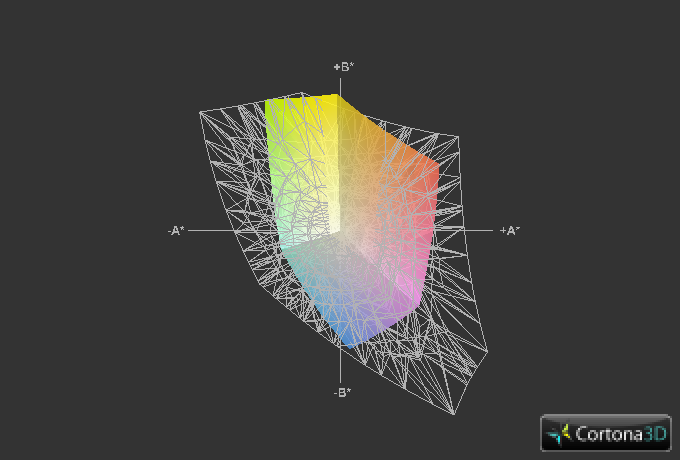 The display lid opens to around a 165 degree angle. 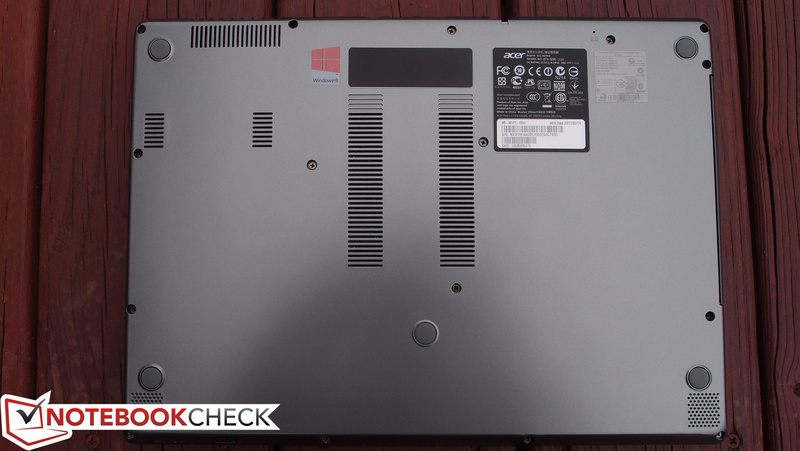 The Acer M5-481PT review model we received included a 1.8 GHz Intel Core i5-3337U dual-core CPU, which is an ultra-low voltage (ULV) model. Based on the Ivy Bridge architecture, this model is manufactured using a 22 nm SOI and boasts a TDP of just 17 W. Its base clock rate is just 1.8 GHz, but via Turbo Boost, it can reach clock rates of up to 2.7 GHz and 2.5 GHz for 1 and 2 active cores, respectively. 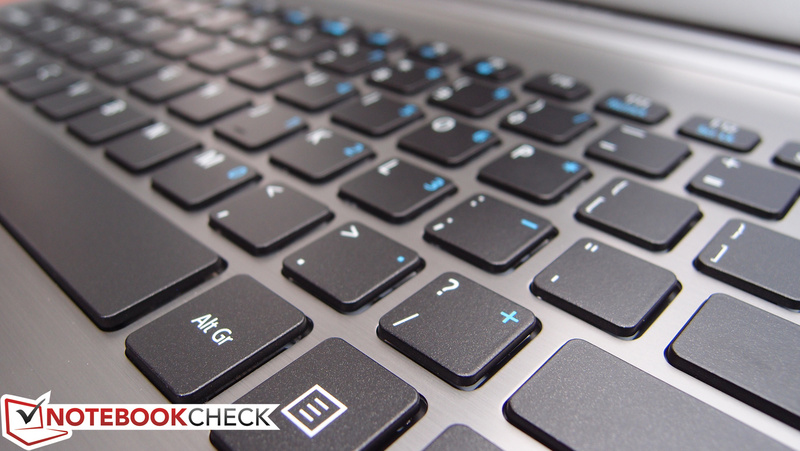 For more technical information and benchmarks on the i5-3337U, see our dedicated page here. In terms of RAM, the notebook leverages a single Nanya brand 4 GB DDR3-1333 SODIMM, coupled with 2 GB of onboard system memory, for a total of 6 GB total. This is the maximum available for the system, so there’s no reason to contemplate an upgrade—but should you encounter a failure, as noted earlier, replacement of most any component in the M5 is a challenge, since much of the notebook must be disassembled in order to reach the internals. 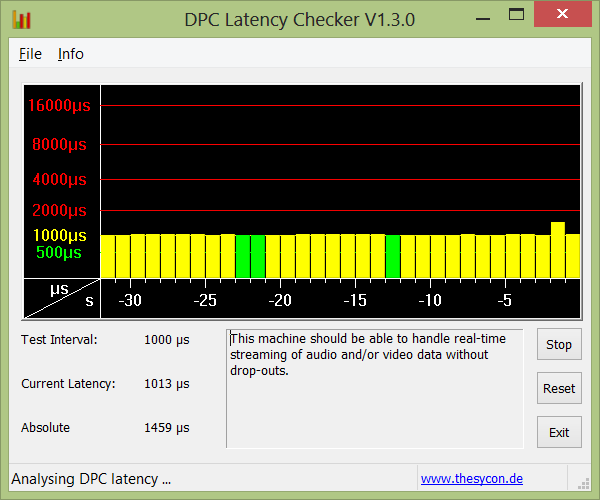 DPC Latency Checker reveals no issues with the M5’s ability to stream real-time audio and video. As always, remember that differences in Windows 8’s implementation of kernel timers results in a false reading of an additional 1 millisecond when using the tool—so the results are actually excellent here. 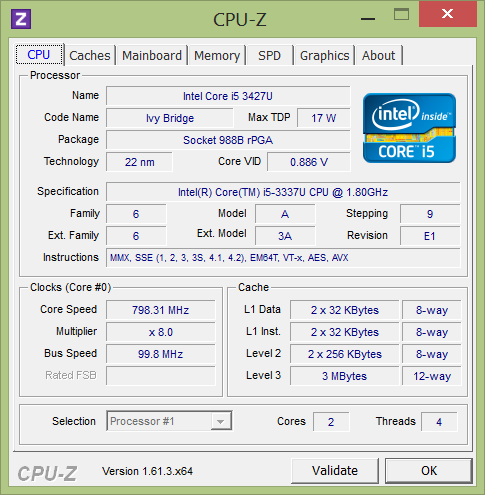 The Intel Core i5-3337U is a member of the refresh of the Ivy Bridge ULV processor lineup that was announced in January, 2013. 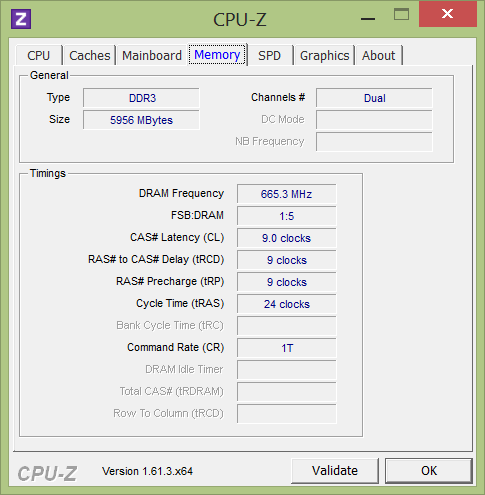 For the most part, it is the same CPU as the i5-3317U that came before it, but with a 100 MHz higher clock rate and a 50 MHz higher maximum graphics frequency. 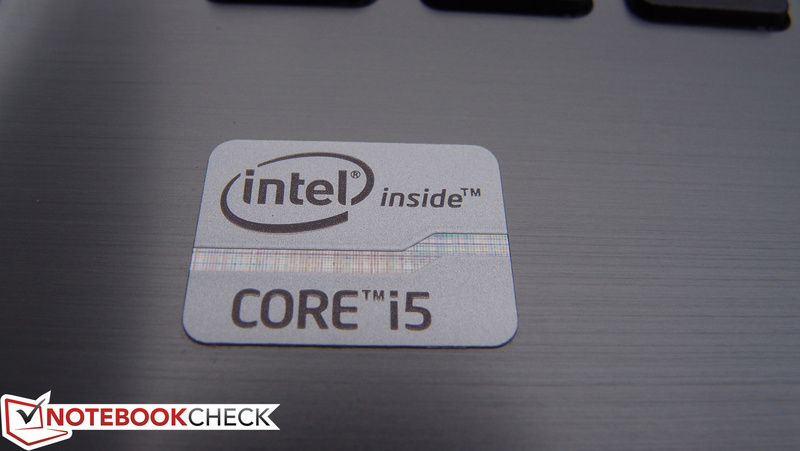 Thus, it shouldn’t be too surprising to see it performing comparably to its predecessor in synthetic benchmarks, which is ultimately just about on par with some recent standard-voltage CPUs, such as the Core i5-2410M. 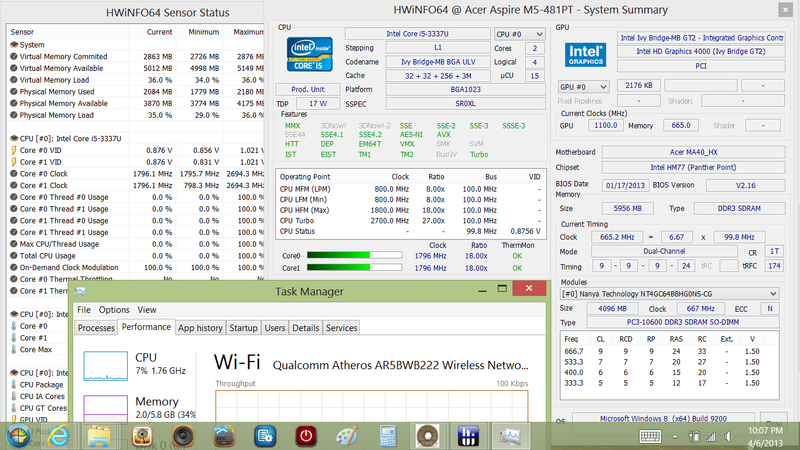 For instance, in Cinebench R10 xCPU 64-bit, it trails by just 5% when compared to the i5-2410M, while in the single-CPU test, it’s actually a dead heat, with scores of 4490 and 4482 for the i5-3337U and i5-2410M, respectively (and the M5’s scores we collected here are actually even higher). Our synthetic benchmark results place the Acer M5-481PT’s CPU performance at just around the same level as most comparably-equipped competitors, such as the Dell XPS 13 L322X and Acer M3-581PTG, but a notch above the Sony Vaio SV-T1511M1E/S. Regardless, it’s most certainly adequate for the target home user, and will have no trouble conquering everyday tasks, whether it’s web browsing, office work, HD video playback, or even light gaming. 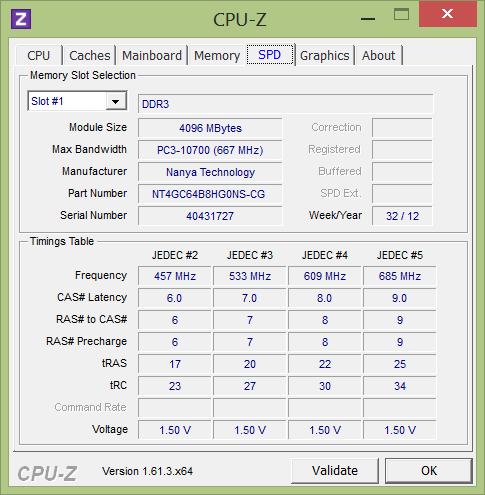 On Windows 8 PCs, we assess general system performance using PCMark 7, since PCMark Vantage (at the time of this writing) remains incompatible with the OS. Be sure to take a look at our recorded Windows 8 Experience Index scores below as well—but remember that the metric is different from that of Windows 7 machines, so it isn’t directly comparable. 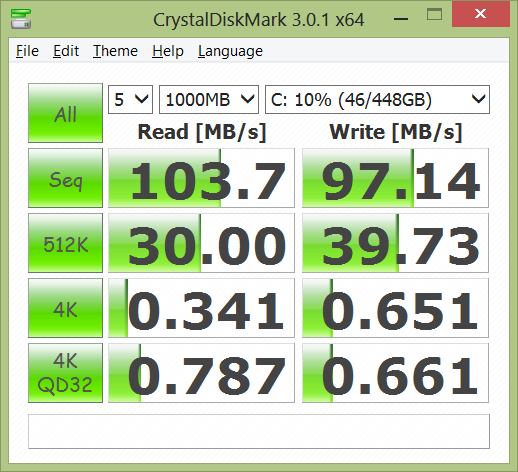 We were able to record a commendable PCMark 7 value of 4052, which is quite clearly due in part to the SSD’s caching mechanism. 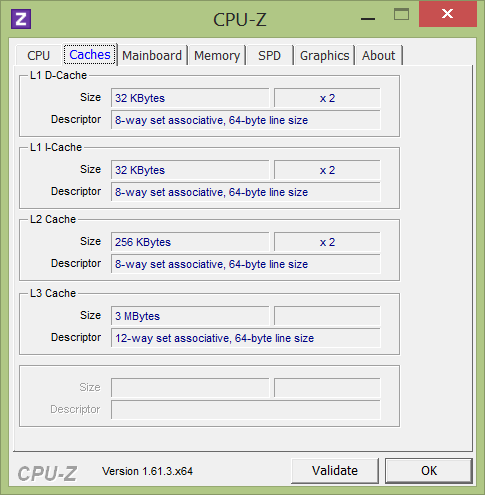 Multiple consecutive runs were performed using the tool to achieve this value. This score is superior to many Ultrabooks equipped with just an SSD only, in fact (such as Acer’s own M5-481TG), which is impressive—but again, it is important to remember that this synthetic measurement may not correlate directly with real-world use. Subjectively speaking, the system does feel quick and nimble. Applications launch without much of a wait and operation never seems sluggish. Our M5-481PT review unit included a Seagate Momentus Thin ST500LT012-9WS142 500 GB 5400 RPM drive coupled with a 20 GB mSATA SSD for caching purposes. While this is only a 5400 RPM drive, given the current configuration, it actually achieves a transfer rate average of 88 MB/s, which is closer to that of a 7200 RPM drive. As with the RAM, the hard drive will be practically inaccessible to most users should they need to replace it for any reason. If they should have to, however, it is also worth noting that the drive is a 7 mm height model (as opposed to the standard 9.5 mm). 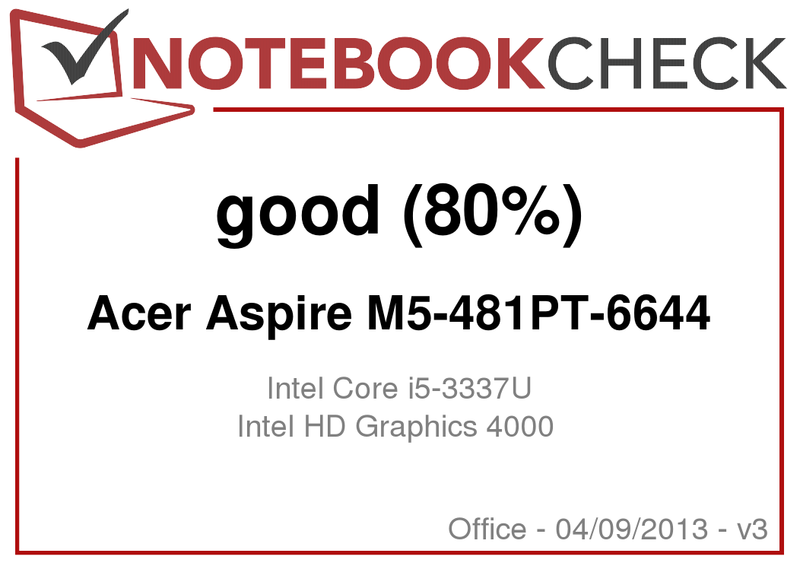 Our synthetic GPU benchmarks place the Acer M5-481PT right in line with most other similarly-equipped models. For instance, the XPS 13 L322X we reviewed (equipped with the same CPU and GPU) scored very comparably in nearly every GPU-oriented test we performed. Our actual gaming benchmarks reaffirm these findings. 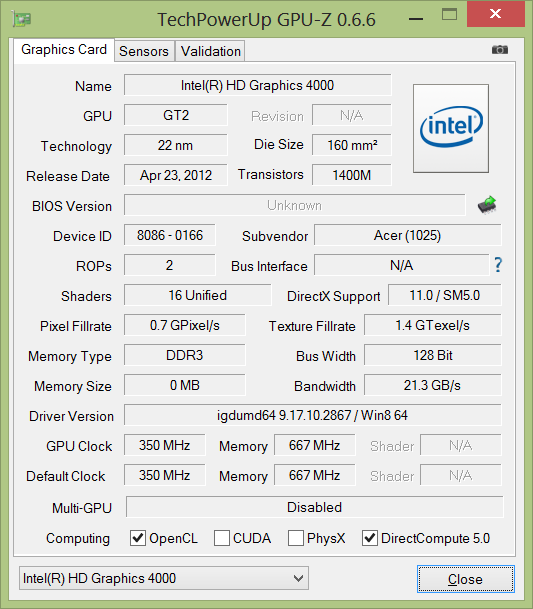 The Diablo III results, for instance, were just a frame or two off from other models sharing the same CPU and GPU. Starcraft 2 also is completely playable on lower settings. For better gaming performance (again, if you don’t mind sacrificing the touch screen), the Acer M5-481TG’s NVIDIA GeForce GT 640M LE proves a much more capable solution. 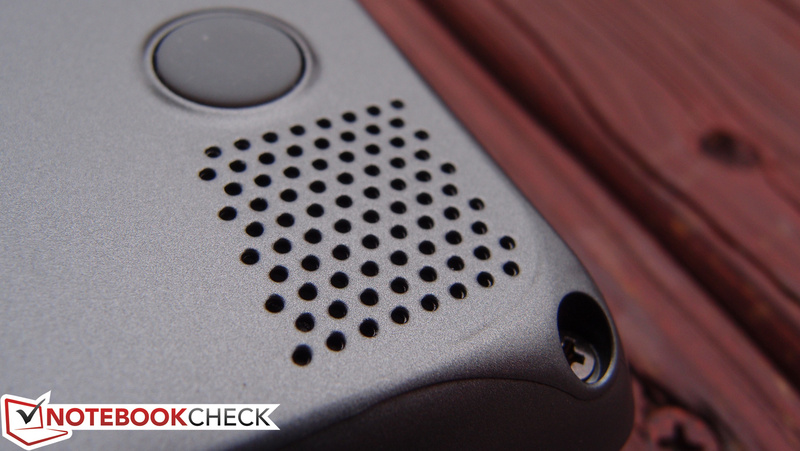 When idle, the M5-481PT is practically silent, with a median noise level of just 31.2 dB(A). When under load, things can get a bit noisy—we recorded a maximum value of 43.3 dB(A)—but for the most part, the notebook remains relatively inconspicuous with a median load value of just 36.8 dB(A). Finally, DVD playback rests someplace in between, with a noise level of 38.3 dB(A) resulting in part from the added optical drive noise. Even when running at a high RPM, the fan’s tone is that of a subtle whir as opposed to the high-pitched whine that is common in many ultraportables thanks to the constrained size of the parts—so it’s never really that annoying. Given its relative quietness, the M5-481PT posts remarkably cool temperatures under all circumstances. 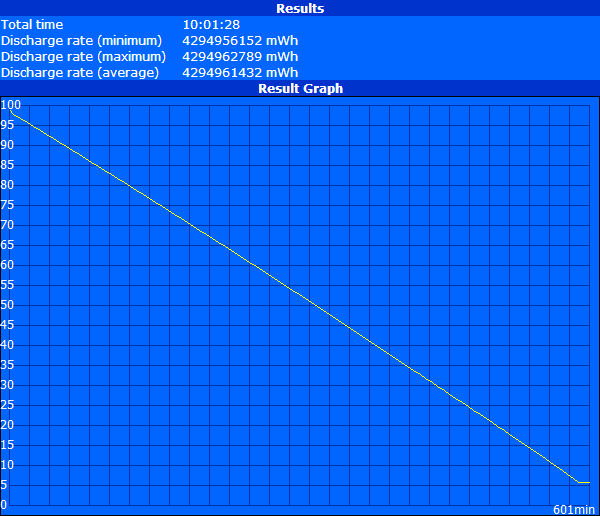 When idle, the highest value recorded on the top of the unit was just 29.2 °C in the upper-right above the vent. Underneath, the center top was the hottest region, yielding a reading of 29.8 °C. Both of these values are most certainly acceptable, though it is worth mentioning that temperatures on the right side of the notebook are perceptibly warmer than those on the left at nearly all times. Under load, things are perhaps even more impressive. 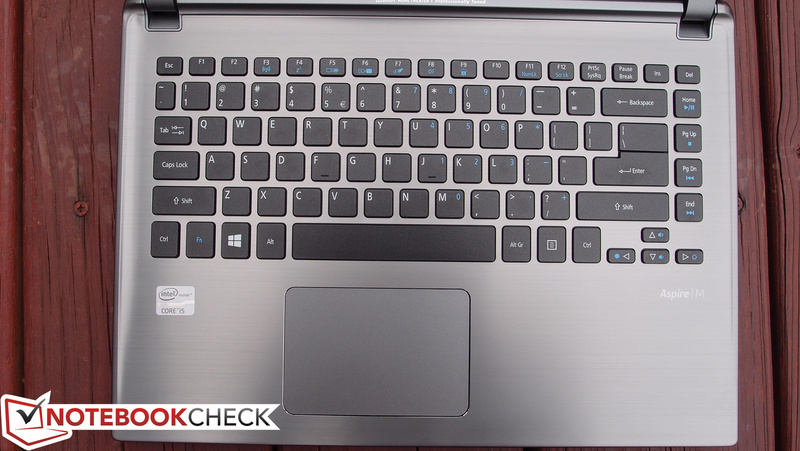 The M5-481PT never recorded a single value above 37.4 °C, which happened to be located directly in the center of the keyboard on the top of the base unit. The underside of the notebook never ever climbed above 35 °C (in the same location). These temperatures are warm, but hardly even bothersome. Every notebook review we assemble includes a comprehensive stress test of the machine under heavy load conditions using Prime95 and FurMark. 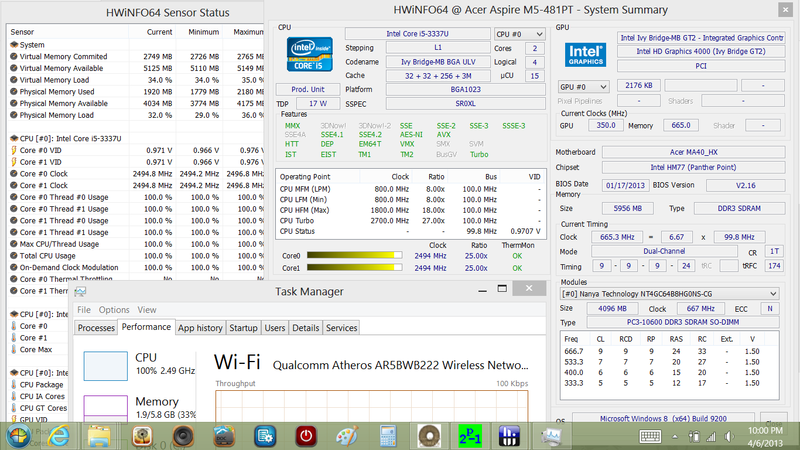 Under full CPU stress, the Acer M5-481PT had no trouble maintaining a maximum Turbo Boost frequency of roughly 2.5 GHz (multi-core), which is impressive indeed given the low temperature readings and noise levels noted earlier. Under full GPU stress, the CPU frequency remained steady at 1.8 GHz, while the GPU frequency was mostly rock-solid at its maximum of 1100 MHz. Finally, under full system stress, the system buckles a bit, with CPU remaining reliably locked at 1.8 GHz, but the GPU reducing its Turbo clock rate to between 700 and 750 MHz. It’s exceedingly rare that such circumstances are encountered during real-world usage, however, so such faltering under synthetic load (especially for an Ultrabook) should not be taken as a serious negative but rather merely an interesting side note. 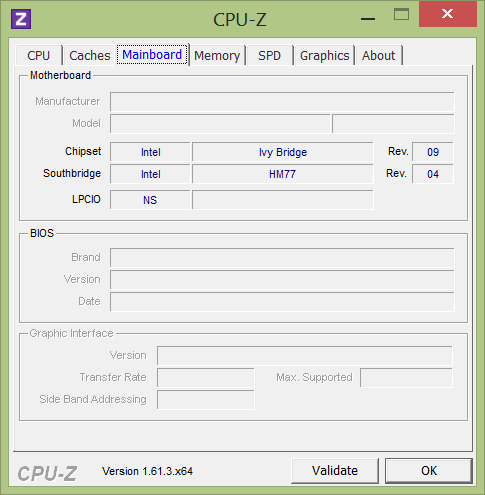 Recorded CPU temperatures under continual load never climbed above 74 °C. 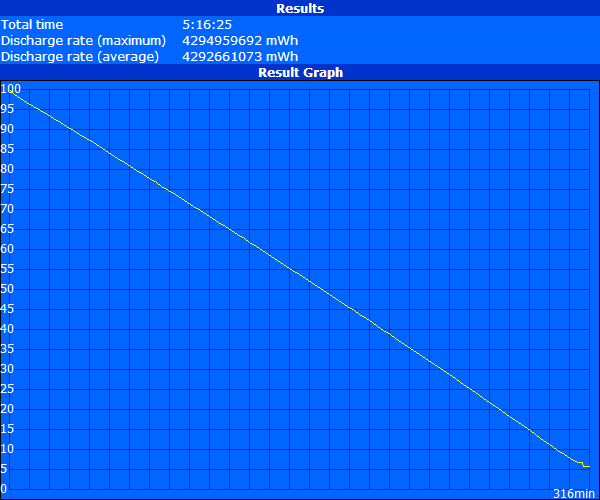 To illustrate the fact that such conditions should not affect the notebook under typical use, we performed a subsequent run of 3DMark06 directly after one hour of full system stress and received a result of 4837. The M5’s speakers predictably lack the bass and balanced frequency response of larger, higher-quality drivers on bigger notebooks. But one thing they certainly don’t lack is volume. The M5 is loud enough to fill a fairly large room quite easily, even if the quality of the sound isn’t pristine. 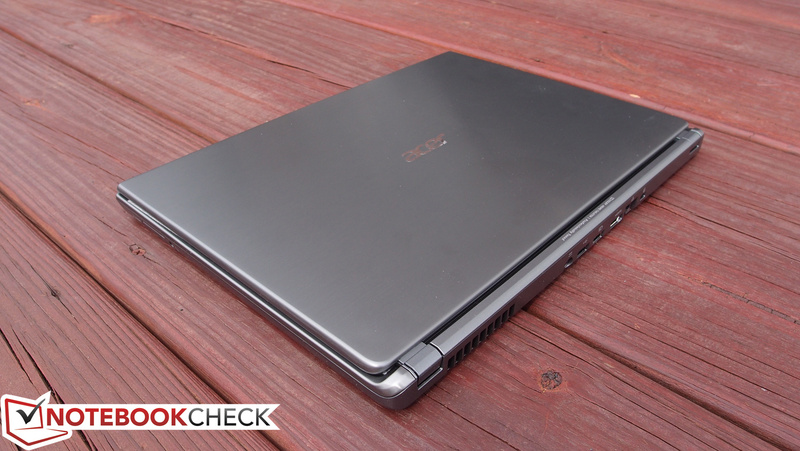 The Acer M5 has nothing to be ashamed about in terms of battery life. 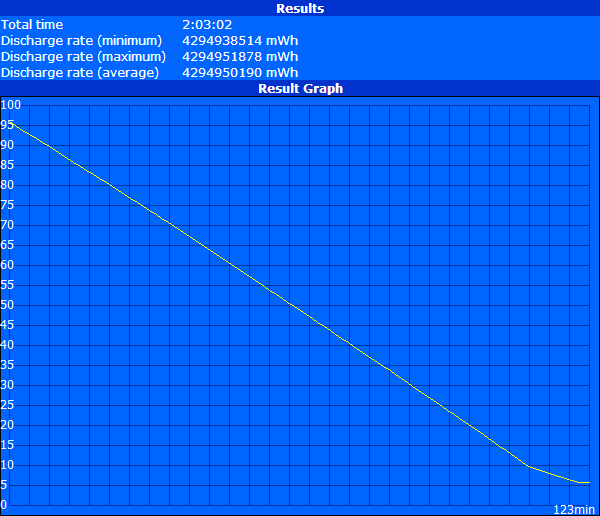 Using Battery Eater, we subjected the internal 3-cell battery to our usual range of tests. Under ideal battery usage conditions (minimum brightness, idle, wireless off, Power Saver profile), we recorded a total runtime of around 10 hours, which is quite good indeed. 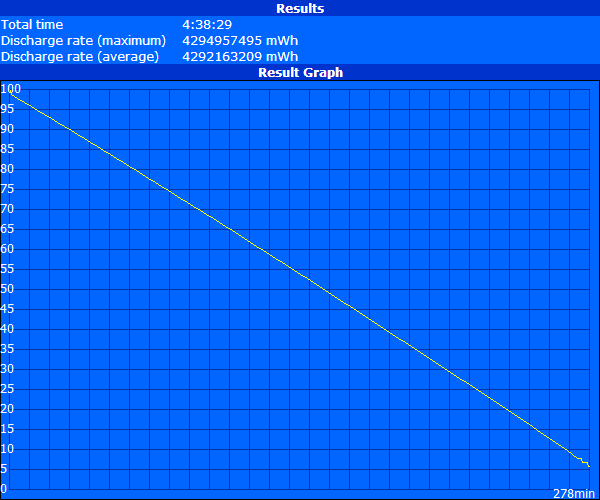 On the other end of the spectrum, we recorded a minimum battery life (under full load) of about 2 hours. For a more useful assessment of real-world performance, we simulate surfing with Wi-Fi. Under these conditions, we recorded a runtime of 5 hours and 16 minutes. Finally, our DVD rundown test resulted in a life of just over 4 and a half hours. If you’re looking for the full Windows 8 experience, your options are getting better by the day. 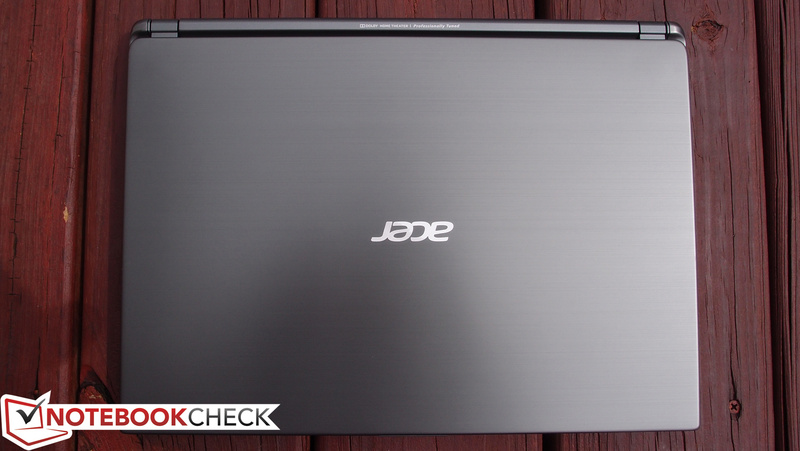 The Acer M5-481PT is one of a growing number of like-minded offerings—emphasizing portability and performance above all else, and sacrificing a bit in the realms of design, durability, and display quality to keep the price attractive. Other quirks exist—such as the unwieldy touchpad and puzzling port placement—but the total package is attractive for the price. If you aren’t partial to Windows 8 or don’t need a touchscreen, you might find a better choice in the Acer Aspire M5-481TG, which also features dedicated graphics—but overall, if touch is a must and budget is a concern, the Acer M5-481PT is a worthy contender. ...and looks great in the dark. All of these screws must be removed to access internal components. ...with its slim, ultraportable form factor.